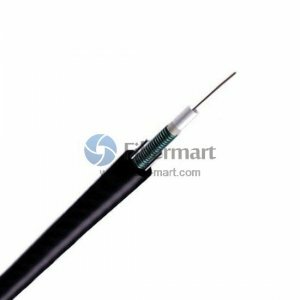 GYXTW is an outdoor optical fiber cable suitable for aerial and duct applications which is single-armored and fully waterproof. The fibers are positioned in a loose tube made of a high modulus plastic. The tube is filled with a water-resistant filling compound. The tube is wrapped with a layer of PSP longitudinally. Between the PSP and the loose tube water-blocking material is applied to keep the cable compact and watertight. Two parallel steel wires are placed at the two sides of the steel tape. Fiber-Mart provides GYXTW from 4 fiber cores to 12 fiber cores. Both single mode type and multimode types are available. We also provide Customized Service such as fiber number, fiber color and cable length, etc.